Here are some of what an American, an English, and a French authors had to say about the beautiful Damascus of the 19th century. "... no recorded event has occurred in the world but Damascus was in existence to receive the news of it. Go back as far as you will into the vague past, there was always a Damascus. To Damascus years are only moments, decades are only flitting trifles of time. She measures time not by days, months and years, but by the empires she has seen rise and prosper and crumble to ruin. She is a type of immortality. She saw Greece rise and flourish two thousand years, and die. In her old age she saw Rome built, she saw it oversahdow the world with its power; she saw it perish..... She has looked upon the dry bones of a thousand empires and will see the tombs of a thousand more before she dies." "The juice of her life is the gushing and ice-cold torrent that tumbles from the snowy sides of Anti-Lebanon. Close along on the river's edge through seven sweet miles of rustling boughs and deepest shade, the city spreads out her whole length; as a man falls flat, face forward on the brook that he may drink and drink again: so Damascus,thirsting for ever, lies down with her lips to the stream and clings to its rushing waters." "through a gap in the rocks, my eye fell on the strangest and most fantastic sight which man has ever seen: it was Damascus and its boundless desert, a few hundred feet below my path... first the town, surrounded by its walls,,, a forest of minarets of all shapes, watered by the seven branches of its river, and streams without number, until the view is lost in a labyrinth of flower gardens and trees....."
Unfortunatily, many people who read these positive appraisals would feel disappointed when they visit Damascus of the 21st century. The city that has survived many invasions and wars for centuries is withering little by little. The river is drying up. The flowers are being pulled out. The gardens have been destroyed. The people are abandoning her. The overwhelming strive of restoring and maintenaing the dying beauty is put in the hands of a few locals and foreigners who have been mesmerized by her beauty. 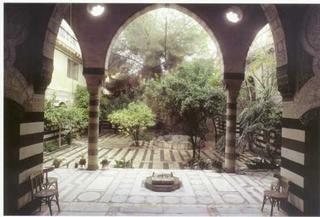 Damascus is a remaining of a legend. It survived invasions carried out by almost all prosperous civilizations existed for thousands of years, but could not survive the misuse that has been carried out by her own people. be grateful if you could fill it in. It only takes about 8 minutes. My survey closes on the 20th August. pass the word, that would be great. I wanted to make a whole new entry about what the Prophet Muhammad said about Damascus :) There are two legends about that, and both of them are really amusing. Beautiful pictures and VERY informative -- thanks for a great blog read! I'll make sure to come back as I like to learn about new places & cultures! Hi! thanks for visit my blog (sorry, my english is BAD!!). "The street called Straight is straighter than a corkscrew, but not as straight as a rainbow. St. Luke is careful not to commit himself; he does not say it is the street which is straight, but "the street which is called Straight." It is the only facetious remark in the Bible, I believe." you hav a very informative blog and damascus sounds a nice place to visit. plz check my blog out! Nice blog, see you at internet. I liked your blog. In "my" country Tébar ( Cuenca )Spain- España..remenber my grand mater stories of Damascus in 840 year..in Alarcón. A most interesting blog. Please come by mine and leave a comment on the material. it really is a shame when our history and previous trimphs is celebrated by people from other countries and looked at as an eye sore by locals..
we have had an incident in wonderland recently where an MP stood in parliament and said that the a'ali burial mounds which date back to the Dilmun civilisation should be bulldozed because they remind him of the country's pagan past ! Yes I agree, the beautiful Damascus that existed until the 1930's is dead, some beautiful houses are still here but that's it. The same thing is happening in Beirut. What a beautiful and wonderfully written post. Great Blog...no doubt. The question remains about Damascus: what happened now. The old city is still the most adorable place to be in for me; but how can we get te city back to sth that people praise again. And for the issue of her people betraying her; that is true to some extent, but do u really think that all what happened in that last 40 years was simply "governmental ignorance"
Today, blood is up to the knee in Damscus. God bless her!